Some people enjoy online gambling for the fun of it, while others are more focused on winning big. If it’s winning that drives you to gamble online, it helps to know which games have the best and worst odds. After all, if you’re playing games with very low odds, the chances of you winning big are quite slim indeed, On the other hand, if you’re playing games with high odds, you could well stand a good chance of winning a huge, potentially life-changing cash prize. It’s good to understand online casino games odds, so let’s have a look at what they’re all about. If we’re going to talk about which online casino games have the best and worst odds, we need to first talk about house edge. Casinos, both online ones and land-based ones, are businesses that need to make money. They’re able to make money because their games have a built-in advantage, known as the house edge. It’s represented as a percentage and refers to how much a player can expect to lose on an average bet relative to the full amount of their bet. For example, say the house edge on a game is 5% and a player makes a bet of $10. That player would expect the casino to earn $0.50 from the bet (the 5%) and would be left with $9.50 (the remaining 95% of the amount wagered). 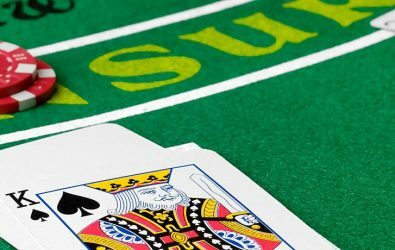 The average player loses money at a casino (the money the player loses goes to the casino) and doesn’t make a profit on their gambling – it is, of course, possible to win big and make a profit on your gambling, but taking all players into account, the average one ends up losing at least some of their money. Generally speaking, the lower the house edge is, the more money you the player can expect to win over time; conversely, the higher the house edge, the more money you can expect to lose over time. Note that odds vary depending on the version of game and the casino. Of all the casino games, it’s blackjack that offers the best odds. Its house edge is usually around 1%, though it’s actually less than that at quite a large number of casinos. Many players opt for blackjack not only because of its fantastic odds, but also because it’s one of the easiest casino games to play and it’s just you against the dealer, so there’s no additional pressure from facing off against numerous opponents. Blackjack involves you trying to get a higher combination value than the dealer, but without going over the number 21. It’s got great odds and easy, one-to-one gameplay, so it’s not hard to see why blackjack is the most popular table game in U.S. casinos. Coming a close second is video poker, whose house edge is also around 1%. However, you’ll find it’s nearly always just a bit higher than blackjack’s house edge. It’s a game of skill rather than a game of chance: it requires a bit of thinking and is a solitary game. You’ll notice that video poker machines look very much like slot machines. Even so, it’s definitely with sticking with the former if you’re after better odds. There may a bit of skill involved but if you’re good enough, you may even be able to considerably lower the house edge by employing certain strategies. Another casino game with really good odds is craps. It’s a game that may seem quite intimidating to new players, but once you learn about how it works, you’ll soon get the gist of it. Craps is all about betting on the outcome of a dice roll. If you stick with certain bets, you’ll be playing with a house edge pretty much equal to that of blackjack. The key to improving your chances of winning when playing craps is sticking to the bets with a low house edge. You should also avoid the ones with a high house edge. Baccarat is a card comparing game where the maximum value of any one hand is nine. The odds when playing baccarat can be pretty good – you can usually place bets with a house edge close to 1% in most places. It’s worth mentioning that you’re going to get the best odds if you bet on the banker; betting on the player still gives decent enough odds though. When playing baccarat, be sure to avoid tie bets and side bets, as both of these offer terrible odds. Keno is simple game of luck where you choose numbers from 1-80 and hope to have as many of them matched as possible. The more numbers you match, the greater the payout. However, the odds for keno are terrible. In fact, the house edge is usually somewhere around 25%, which is extremely when compared to games like blackjack or video poker. Though slots are a staple of online casinos, they’ve got a reputation for taking people’s money fast. This is because they’re really easy to play and their odds are pretty bad, with an average house edge of around 15%. Unless you’re really lucky, you should expect not to hold on to your money for very long when playing at slot machines. To improve your chances of winning, you need to know the game you’re playing inside out. That way you’ll be able to make the best decisions, place the right kinds of bets and avoid any mistakes—a single slip-up could end up costing you a win. As well as in-depth knowledge of the game, you need a little bit of luck as well. Even though games may have really good odds, they still ultimately favour the house. Play these games over a long period of time and chances are, you will lose money and that money will go to the house. Still, that doesn’t stop millions of people the world over from trying to win big!